Convenient quick access top pocket. Dedicated laptop and tablet pockets with padded protection. MANUFACTURER INFORMATION. Cross-dyed material with a stylish, two-toned look. Large, comfortable carry handle. Two water bottle pocket puts hydration at arm’s length. Targus, TBB013US. The case also features nickel-free hardware and recyclable plastic components. The padded back panel and adjustable shoulder strap allow for a customized, comfortable fit. 25 Years experience. Its zippered front pocket provides quick access to travel essentials, and it has a water bottle pocket on both sides to maximize outer storage. Allow for easy transport. THIS WARRANTY IS NON-TRANSFERABLE. We will work with you directly to resolve any issue you may have. Perfect for the on-the-go techie! Large padded pocket is designed to fit laptops up to 16”. Includes a separate section for your tablet. Internal and external accessory pouches zip for extra security. 2 side pockets for easy access. Media pocket custom fit with a built-in cord and headphone jack. 2 padded adjustable shoulder straps and a padded back panel for comfortable carrying. Securely stands upright to ensure none of your products are damaged when you set it down. Targus - Legend IQ Backpack Laptop Case Black. Condition is New. Shipped with USPS Priority Mail. Large front accessory pocket. Two zippered side pockets. Targus TSB515US. Brand NewIncludes Lifetime Warranty. . Product # TSB515US. . For a thin and light backpack, the 16" Ultralight Backpack has a slim design that is ideal for those who are looking for a low profile backpack.. . TSB515US. Its zippered front pocket provides quick access to travel essentials, and it has a water bottle pocket on both sides to maximize outer storage. Expert Service. Unbeatable Price. Color Category: Black. Manufacturer Part Number TSB75704US. Product Model TSB75704US. You will hardly know you are wearing it! Product Line Sport 26L. Manufacturer Targus Group International. Product Type Carrying Case. Carrying Options Shoulder Strap. MANUFACTURER INFORMATION. Discreet reflective dots. Large front accessory pocket. PRODUCT FEATURES. Manufacturer: TARGUS. Notebook Compatibility 17". Features Zippered, water bottle holder, padded, shockproof, adjustable shoulder strap, headphone cord outlet. Height 19 in. Width 16.3 in. Product Material 840D nylon. Eco-friendly to its core, constructed with polyester made from recycled plastic bottles and features nickel-free hardware and recyclable plastic components. The padded back panel & adjustable shoulder strap allow for a customized, comfortable fit. Trending at $31.55eBay determines this price through a machine learned model of the product's sale prices within the last 90 days. Lined stash pocket gives quick access to gear. New -No Tags. Two front pockets. Two large compartments (one padded for laptop). 18" -H 14" W ~Always happy to combine shipping. ~Smoke free. Color: Red. Color: Black. Check-Out Now! Product Information. Application/Usage: Notebook. Hinged shoulder strap system for comfort. Targus - Motor Backpack Laptop Case Black. Condition is Used. Shipped with USPS Priority Mail. Mfr Part #: TSB945BT. Application/Usage: Notebook. Carrying Options: Shoulder Strap. Color: Black. Maximum Screen Size Supported: 15". Carrying Options: Shoulder Strap. Color: Black. Maximum Screen Size Supported: 15". Compatibility: Apple - MacBook Pro 15", iPad Pro 12.9". Check-Out Now! Carrying Options: Handle. Application/Usage: MacBook Pro. 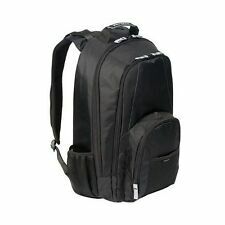 Black Targus Sturdy Expandable Laptop Carrying backpack. Pick 1 or 2. if one is sold, i will remove the pictures. Expert Service. Unbeatable Price. Color: Black. Best Buy Logo. Color Category: Black. Interior Material: Other. Model Number: TSB953GL. Product Weight: 61.7 ounces. A softly lined front pocket is covered in semi-rigid EVA protection, which makes it a great spot for storing sunglasses and cell phones. Color: Gray. Maximum Screen Size Supported: 16". Check-Out Now! Dive into the full gaming experience with all the gear you need wherever life takes you. Protective PVC material on bottom of case repels water. Two side water bottle/umbrella pockets. Trolley strap easily attaches to rolling luggage. You will hardly know you are wearing it! The task of finding a spot for everything can be strenuous. No problem! No cords, no fuss! along with a place for your tablet or iPad; Also equipped to function with most MP3 players by connecting through a cord in the shoulder strap. We are not expert in all areas. PRODUCT FEATURES. Unless stated to the contrary. We will not be responsible. Trending at $27.91eBay determines this price through a machine learned model of the product's sale prices within the last 90 days.